You know, I get a lot of questions about Alethia's breed of dog. 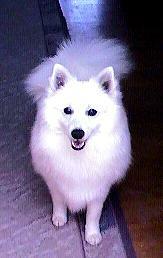 When I say she is a "Japanese Spitz", lots of people assume I am just saying she is a spitz dog from Japan. 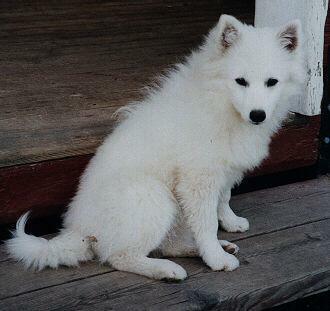 Well, yes, she is from Japan, but Alethia is a an extremely rare breed of dog called a "Japanese Spitz". When you say you have a "German Shepherd", you aren't saying that you have a shepherd dog that is from Germany, you are saying the dog's actual name breed. 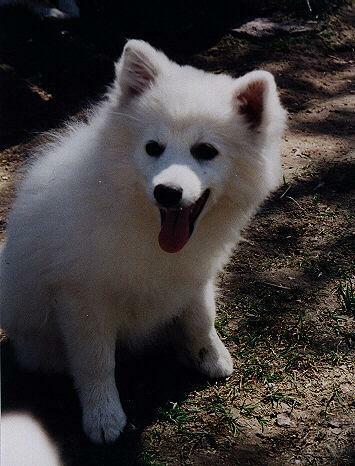 That is the same thing with "Japanese Spitz", I am not saying Alethia is a spitz dog that is from Japanese, I am saying the dog's actual name. Please read on for a little more info and some KYOOTE photos!!! 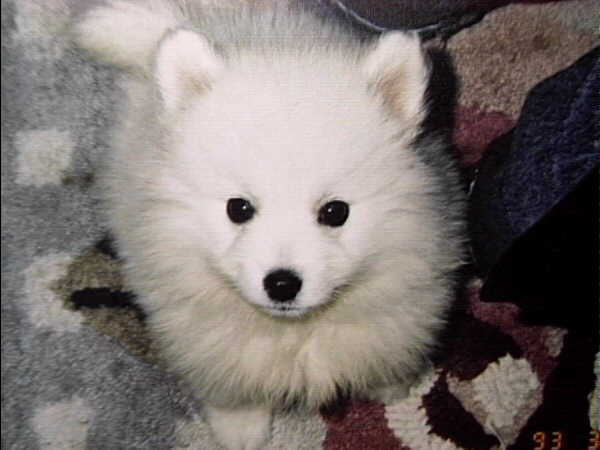 Japanese Spitz Dogs were bred in Japan, and they are characterized by being completely white in color, with a very shart, pointed muzzle and wide, large ears and a small nose. 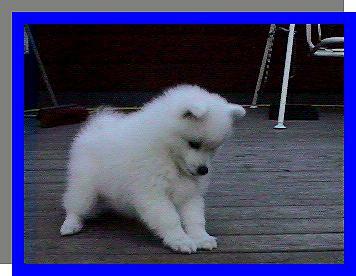 They have a full neck of fur and a large, tail that either sweeps or curls over their back, however, they tend to let their tail hang low or drag if they are tired or upset. 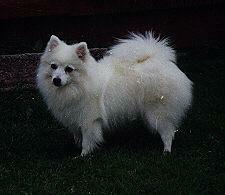 The Japanese Spitz is an extremely intelligent breed of dog, with very acute senses. They are known to be very friendly with young children and the elderly, and are very loyal and protective of their masters. 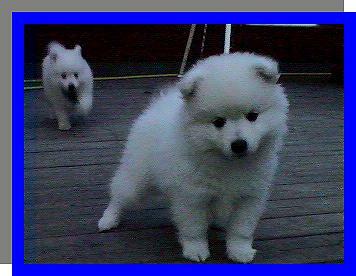 Why Can't I Find Any Japanese Spitz Dogs for Sale Here In America?The Japanese Spitz isn't a very old breed of dog. 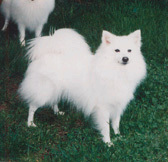 However, around 1955, the Japanese Spitz was the most popular breed of dog in Japan, and was the first dog to receive official recognition in Japan as a purebred. Although, despite that, the dog is only available in one place in America: HAWAII. Most people who are lucky enough to have Japanese Spitzes right here in the United States had to order them and have them shipped over from Hawaii- and that is why you hardly ever see any around ( unless you are mistaking American Eskimos and Samoyeds for Japanese Spitzs ) or any for sale here in America. 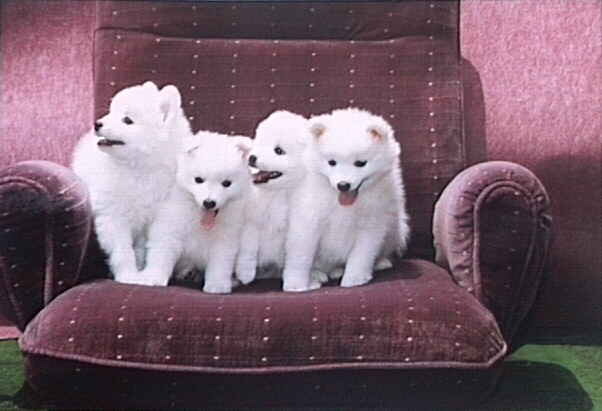 Here are some thumbnailed photos of some adult Japanese Spitz Dogs. All these images here, except for the photo and drawing at the top, were collected from other websites and are copyrighted to those owners and not me. Thank you and enjoy! 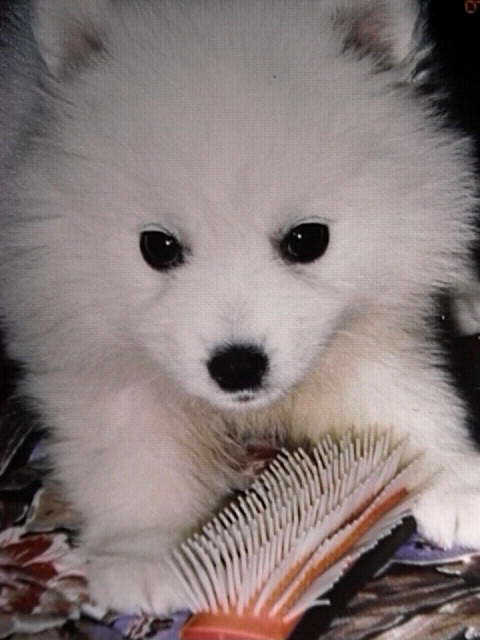 What a gorgeous Japanese Spitz Dog! And she looks so friendly, too!!! 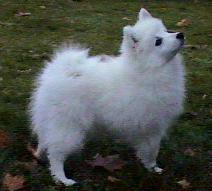 This lovely provides a nice reference shot to viewers on the basic Japanese Spitz body. This one is showing the characteristics of being either tired or bored- her tail is down and her eyelids are closed at different points. Something has caught the eye of these two. 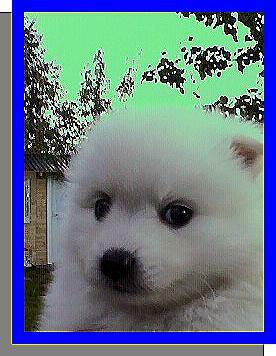 This Japanese Spitz is very lovely, I think, and she is kind of looking over at you as if she asking, "What?" 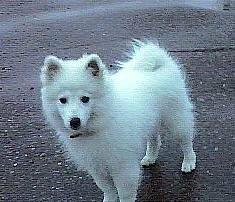 Although all Japanese Spitz dogs have the same colored fur and basic build, you can tell each has their very own, independent look. For instance, just compare this guy to the one above him. There is difference in the carrying of the body, the ears, and the face. 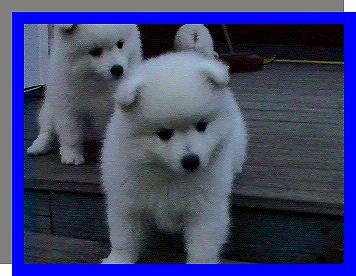 Here are some thumbnailed photos of a whole bunch of absolutely adorable Japanese Spitz puppies!!!. All these images here, except for the photo and drawing at the top, were collected from other websites and are copyrighted to those owners and not me. Thank you and enjoy! This little guy is sporting the "indented brow" that Alethia has. TOO CUTE!!! These little tykes are just so adorable! And this little cutie is sporting an enormous set of ears, like what Alethia has. If you look at only one photo on this page, look at this one! This little guy is so cute I can hardly stand it! It looks like he just pounced on something. Oh my God...this one is SSSSSOOOOOO KYOOTE!!!!! She's just looking up saying, "pick me up!" This adorable pup is just begging you to get that camera out of his face! 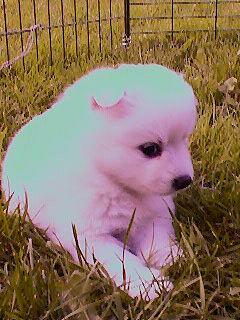 This one is a really teeny pup- must be brand new! She looks very curious about something! 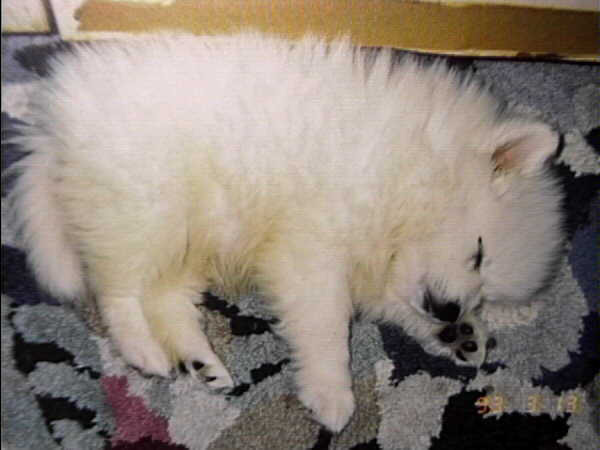 Let sleeping dogs lie.....because they are just so cute!! 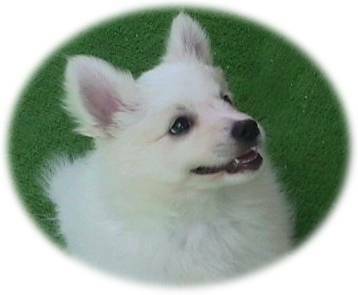 This gorgeous little pup also has the same "indented brow" that Alethia has.